(Nanowerk News) Advanced food-grade fibers are envisioned as ideal complementary candidates to nano- and microscale colloidal particulates in food nanotechnology applications. They could, e.g., be used for tuning the physicochemical and sensory properties of foods such as their appearance, texture, stability, or flavor. Specific fibers could also be the ultimate matrices for the encapsulation and controlled delivery of flavors and bioactive components such as bioactive lipids, minerals, enzymes, peptides, and dietary fibers, to the point where they need to be released (mouth, stomach, small intestine, colon). Assembled into 2D and 3D scaffolds, food-grade fabrics could also be an ideal platform for the growth of healthy food products. However, despite the ubiquitous use of functional fibers in materials science, and notwithstanding the large numbers of common processes between the food and materials industries, fibers have thus far barely been exploited for food production and engineering. The authors of a recent paper in Advanced Materials ("Microstructured Fibers for the Production of Food") believe that the untapped potential of fiber architectures in the production of food is the result of a lack of adequate materials and processing methods to fabricate foodgrade microstructured fibers. In response, they present an approach based on multi-material thermal drawing for the fabrication of a variety of fully edible fibers as a novel platform for the tailoring of healthy food production. According to the Swiss team at Ecole Polytechnique Fédérale de Lausanne (EPFL), this method is simple and scalable, enables the production of fibers with complex multi-material architectures and shapes, and relies entirely on the tailoring of materials flow without resorting to solvent-based strategies. 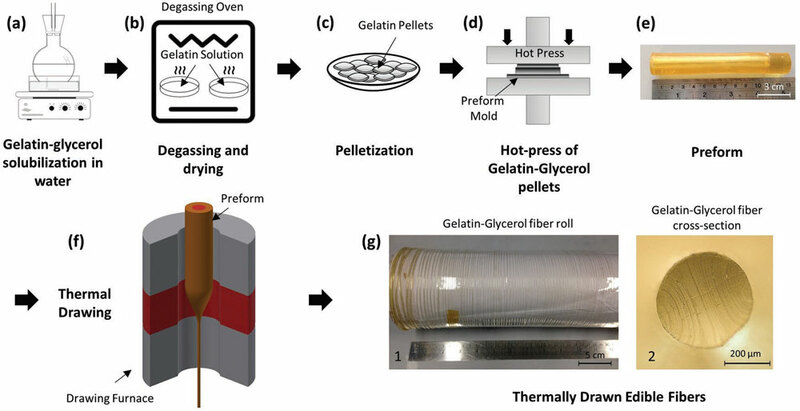 First, the scientists identify materials that can be compatible with thermal drawing by plasticizing food-grade materials such as gelatin. Then they demonstrate the thermal drawing of extended lengths of edible fibers with a variety of shapes, surface textures, and integrated microchannel arrays. In their work, the team establishes a process that enables them to tailor post-drawing the mechanical properties of edible fibers for the future tailoring of suspension rheology. They then show how hollow channels inside the fibers can be filled with nutrients by co-drawing or post-filling. This work also demonstrates that nutrients’ digestion and release kinetics can be tailored thanks to the encapsulating fiber structure. These food-grade fibers can be woven, leading to fully edible textiles integrating complex encapsulated nutrients. The authors conclude that this process, being applicable to a variety of food-grade materials, constitutes a new platform that can address the fundamental challenge of food science to deliver healthy food products while tailoring their taste and texture.